I’m posting this blog on behalf of an undergraduate student who wishes to be anonymous because of the very personal content of this piece, in which they discuss how they have dealt with depression. I think it is important for people to talk about their mental health in order to break the stigma. I realised however, how am I meant to encourage people to talk about their mental health if am not willing to talk about mine? I believe that having mental health issues is nothing to be ashamed of yet I am ashamed and scared to tell my story. Will people look at me different? Will they even understand? Will they treat me different? Then I finally came to the realisation ….. I don’t care! If sharing my story helps one more person feel less alone then I am going to do it. I guess I will just have to start from the beginning…. Yep, I do not like that word either. When I asked my friends what they thought depression was I kept getting the same answer: “deep sadness”. That could not be further from the truth! Depression for me was a sense of numbness, I felt like the tin man out of the Wizard of Oz – I needed a heart. I was a robot, I was a zombie, I had no emotions. I got asked the same question every time “what do you think caused you to feel like this?”. I had a wonderful childhood, a loving family, loads of friends, I did really well in school – there was no reason for me to feel like this …. and yet I did. I used to feel really guilty because there are people in the world who have it way tougher than I have. So I have no right to feel like this. I should not feel like this. Everyone else is functioning perfectly so why can’t I? Why can’t I just be normal? Unfortunately like all illnesses, they do not discriminate. They do not take into account your gender, your background, your religion or even how good of a person you are. So what to do now? I made friends with the monsters under my bed. Winston Churchill referred to his depression as a black dog that followed him about. Mine was definitely not a black dog because I love dogs! I could not tie depression to one thing because in reality it is not one thing. It is not sadness, loneliness, tiredness, no motivation, it is a bit of everything. It just depended on the day which monster decided to come out from under my bed. In the last year and a half the monsters have stayed under my bed – I think they are too comfy there. I got the proper help I needed and now the monsters under my bed are my friends. I have made piece with all of them. They remind me of how strong of a person I am. They remind me of everything I overcome. I am very thankful to these monsters as they have made me who am I today – a complete badass. The CIPR’s 2018 State of the Profession survey indicated that 16% of PR practitioners in the UK have mental health issues. The first semester of final year was a frantic, challenging yet worthwhile semester. For me it was a bumpy, bendy road fraught with many surprises and many late nights in the library with pressure levels heightened due to the fact that this really is our last chance at achieving the status quo in society “A degree”. Now in final semester, we can see university life ending and working life beginning. I’m starting to understand that stress is customary in final year; they go hand in hand like strawberries and chocolate. 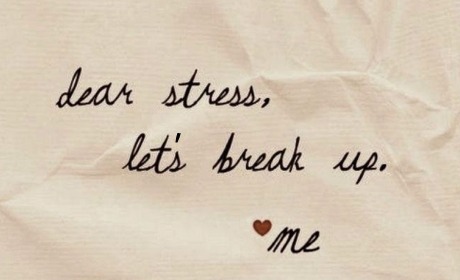 However, stress is necessary, if you weren’t stressing then you really should be asking yourself do I even really care? I decided for this blog to write about how I can plan to manage my stress over the next 3 months that involves just the simple things. Here are three steps that I plan to implement in 2019 , in the hope that this will help my fellow final year student’s in putting an end their toxic relationship with Mr/Mrs Stress. So laugh, laugh, and laugh – no not in the library like some crazy lunatic if that’s what some of you are thinking and secondly no not in the lecturers face. I mean laugh with friends, laugh on your own or laugh at some random funny videos on your phone. For me personally my go to app to really get me laughing is YouTube, from epic fails to the funniest news bloopers. 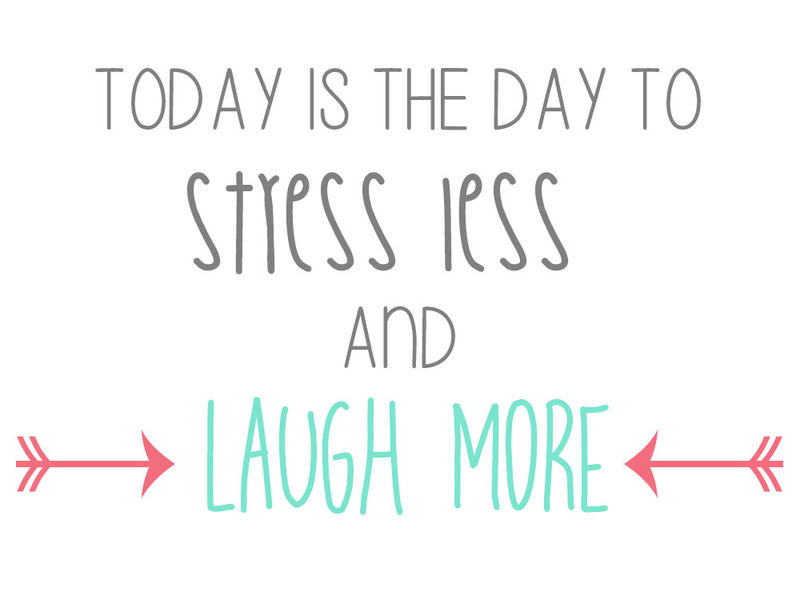 Laughing is by far the quickest and best stress reliever. It really is a workout, one study I found particularly interesting when I was scouring the internet found that laughing hard for one minute is the equivalent to the cardiovascular workout of running a mile- yes it does actually burn calories, unfortunately it won’t do anything for that beer belly! So next time you’re stressed out and someone tries to make you laugh don’t say “don’t make me laugh” just laugh and crack a smile. Rarely will you see the words “drink more coffee” on a list of techniques for reducing stress. I know you’re wondering coffee why would I drink coffee if I want to relax? I’m not saying drink loads of it. I’m saying drink it in moderation, like anything in our diet and lifestyle it’s all about moderation. I myself never believed in coffee, I was an anti-coffee evangelist, but it wasn’t long until I was converted and seen the light. Having one cup before or during studying, I found that it kept me alert and drastically reduced my feelings of stress, reading up on how coffee affected stress levels I found that studies show it can also affect neurotransmitters in the brain to help you fight of symptoms of stress. Think about the last time you were stressed after a long day studying or working on coursework – did you exercise that day? If you haven’t, then you’re missing out. From my experience after spending the majority of my day in the library or in university completing work, I try to always go to the gym or fit in some form of exercise even if it is just 30 minutes. Fortunately for me I have housemates who motivate me to go and they too see the benefits of this. We learn and see about the physical benefits of exercise, but we rarely are told about the mental benefits of it. It is one of the best things you can do to develop a healthier brain and reduce stress levels. If you feel regularly stressed like most final year students (Unless your Einstein) and aren’t frequently exercising, a bit of physical activity might be just what you need. So in this final semester when coursework deadlines, exams and final dissertation drafts are approaching take one or two hours of your day to do a physical activity which you enjoy, because I know I will. Don’t skip a chance to exercise; you’ll be doing yourself a favour. The 10th October 2018, the day I realised a whole lot more than I originally thought I knew, the day I believe I can say confidently now that a lot more people than just myself came to a great amount of realisation and had their eyes opened. The day that was World Mental Health Day. This is a topic I have never really spoken to anyone about in great detail, maybe because I didn’t think it was particularly relevant to my life or due to a lack of complete understanding of the topic even though obviously I was always aware of it. On this day, I realised how important the topic of mental health really is, from scrolling through all social media platforms, my phone was covered with the hashtag #WorldMentalHealthDay2018. It amazed me to see how many people were confident enough to come out about their struggles with mental health, no matter how big or how small these struggles were. I think it really hit me the most and made it so real to me when I read a very brave post written by someone very close to me. I couldn’t help but feel slight guilt however, when I was reading it. I was always aware that this person had their struggles but never did I fully understand the extent of them and how much they affected her life. If you were to ask my friend group, or anyone that knows and loves this person what their personality traits were, you would’ve got answers such as care free, laid back, doesn’t give a s***, cool as a cucumber, easy-going, cheerful, enthusiastic, upbeat, I could go on all day but I’m sure you get the idea! This person was so good at hiding how she was really feeling and telling you that she’s OK and making sure that everyone else around her is OK.
You never truly know what’s going on behind closed doors, this is why it is so important that we be kind every day, ask your friends, your family, your dog, your granny, anyone if they’re OK. A simple chat is all they might need to let them know you’re there. This amazingly selfless person who has been my inspiration behind this blog, took the brave step on the 10th October 2018 to post about her struggles, not for attention, but for anyone else going through problems or issues similar to hers to let them know that it is absolutely OK to ask for help and to not try to battle your demons on your own. Our generation needs to stop letting social media platforms take over our lives in negative ways. Don’t get me wrong, I believe social media is so powerful and great for topics such as this to raise awareness and try to bring about change. I love how this year especially, I think that the stigma that comes along with mental health has been broken down that bit further due to the help of social media. However, unfortunately, as I said before, it can cause so many negative effects and has the potential to be so poisonous, especially on young adults and teenagers. All of the famous bloggers and instagrammers with thousands of followers and seem to have the perfect life through these platforms that we all wish we could be like? FAKE NEWS!! People aren’t going to post the bad things that happen in their day to day lives, that’s why their instagrams, facebooks, snapchats etc look so perfect. They get to literally put a filter on their life. We need to start trying to teach ourselves to stop comparing our lives and our looks to other people who we don’t even know. I need to take my own advice here because I am so guilty of doing this sometimes and letting it affect my mood, which I’m sure majority people reading this blog might be guilty of this also. Let’s continue to break the stigma, live our own lives, stop living behind smartphone screens, be kind to everyone around us, realise that nobody is perfect and know that it is absolutely OK to not be OK.
On October 10, World Mental Health Day, many people took to their social media to share a quote or inspirational story to advocate and honour mental health. However, this year, I noticed the prominence of poor mental health within young people, and more specifically, young people I knew. I was shocked to read and see the abundance of them taking to their Instagram or Twitter to share their own stories, which discussed their own personal battles with their thoughts. I did some reading, and saw “half of all mental illness begins by the age of 14“, and because I was fourteen almost nine years ago (pls), it made me think that so many people I’ve crossed paths with over the years could have a mental health issue that they don’t actively talk about. So, what can we do to assist our friends, or even strangers, that are suffering from poor mental health? Well, after I read a splurge of stories on my timeline, it began to resonate within me that there shouldn’t be just one day in the year where people are more empathetic, more considerate, more pleasant or more compassionate. I realised that we just need to be more, and we need to be it more often. Being compassionate: When someone experiences misfortune, there is solace for them in knowing somebody is trying to understand and sympathise. It’s easy to forget, but a simple text to say you’re thinking of your friend can go a long way in times of their struggle. Being empathetic: Following sympathy, there is comfort in knowing you’re not alone, especially when your mind is tricking you into thinking you are. Empathising with people when they’re in situations you have previously been, or are currently, in, can be extremely beneficial to mental health. For example, sharing advice and understanding when someone has lost a family member. Showing consideration: Be considerate in your actions that are going to affect people around you. Even after a stressful day at work, always remember to consider how other people are feeling. In a LinkedIn article I read online, it discussed how a man had jumped off The Golden Gate Bridge, leaving a note at his home which read: ‘I’m going to walk to the bridge. If one person smiles at me on the way, I won’t jump.’ Our smallest actions can have the biggest impacts on another person. Being pleasant: Being a pleasant person is the more obvious example of how we can benefit the people’s lives around us. However, being pleasant can also benefit our own mental health: “It can reduce stress, improve our emotional wellbeing and even benefit our physical health.” It’s a win-win for everybody involved! Now, it’s early days yet, and I don’t want to jinx it, but I would say 2018 has been my year (finally, says I to you). However, that’s because I’ve actively took the bull by the horns and did what I had to do to make myself happy. I am refusing to sit in the backseat of my life, and instead I’m upfront steering it in the pursuit of happiness. I noticed that happiness comes from within, and usually is either environmental or situational for me. Below are some brief tips on how you, too, can make a change. Exercise. Sweat. Run. Sweat. Dead lift. Sweat. Squat. Sweat. Your mum, doctor, and the internet were all correct. If this was a physical piece of paper I would underline that word so many times. Exercise. It is the cheapest form of therapy you can provide yourself with. Exercise has obvious physical benefits, but also positive effects on: our mood, our stress, our self-esteem and “can be an alternative treatment for depression”. After getting a personal trainer at the beginning of the year, I have found the benefits have went far beyond my physicality. Eating sugary foods causes our body to have initial ‘high’ or surge of energy that soon wears off as the body increases its insulin production, leaving you feeling tired and low. Therefore, the consumption of whole grain foods is more important, which lessens the chances of mood-swings and lethargy. Start each morning with a healthy and nutritious breakfast – it takes only 21 days to form a habit, and by doing this you’re less likely to “fall off the horse”. Enhancing your knowledge on nutrition is also vital to enabling your change of diet and lifestyle – I’ve come a long way from Pot Noodles in the Holylands, or rolling out of the Hatfield and into Together Chinese. I love the craic, but over the years it has left me in positions where I’ve been swayed into doing things I actually have no interest in doing (serious FOMO, y’know), and I’ve then been left mentally unsatisfied and usually out of pocket. This year, I made an oath to put myself first and no longer entertain the idea that I’m missing out on things I actually don’t like doing; whether it be going to clubs that I secretly loathe, working in jobs I have found mind-numbing, or even watching things that I just don’t enjoy (and so far, so good). If you feel like missing the Bot for some down-time watching Netflix – you should. We all need time to recharge our batteries. Moreover, it is important to understand your body; what causes your stress and discomfort, and then face them head on. With this, you will feel in control, and this will have a positive impact on your interpersonal communication and confidence. Talk. Talk to your friends, your family, a stranger or a doctor. Just talk. There is nothing more mentally liberating than expressing what is getting you down. It can be the most daunting thing, and probably sitting firmly at the bottom of your list; but it will help – a problem shared is a problem halved. There are people literally at the other end of the phone during times of distress. Mark Daly is a final year BSc in Communication Management and Public Relations student at Ulster University. He can be found on LinkedIn at http://www.linkedin.com/in/markdaly123 or Instagram at @markdaly2. Gambling in today’s society is everywhere we look. It is no longer just high street bookmakers where you can go to place a bet. It is accessible at all times and is becoming a huge problem and ruining the lives of many. If you want to gamble you can do it at any time, which leads to huge financial problems for many. Whether it is going to a bookies to place a bet, going into the pub for a pint and playing a fruit machine or playing cards with friends, you can gamble on anything and at times lose a substantial amount of money. Within our generation it is always a topic of conversation. You go into the bookies and it is almost like a social gathering spot, with many of your friends there placing bets and seeming to enjoy themselves, however gambling is a very silent killer for many. It knows no boundaries, and is getting worse constantly. Gambling is advertised and marketed for you to get the belief you will win money. You see many adverts saying place a £10 bet and get £30 in free bets online, this seems like an offer you can’t refuse. At the time, yes this is a good offer, however this gives a bookmaker access to you at all times. Now that you have an online account you can bet at any time, and in your eyes, win money at any time, however this is not the case, you are likely to lose a lot more than you win. The bookie is always going to be the winner. So why is this such a problem and so popular? Northern Ireland has the worst rate within the UK for problem gamblers. This statistic was recorded in 2016 by the charity CARE for Northern Ireland. Gambling is such an issue because it is everywhere we look, at times people are gambling without realising, and at all age groups. If you’re in the shop and buy a scratch card you are gambling, but wouldn’t consider it. An elderly woman going to the bingo a few nights a week would not truly believe they are gambling, but more socialising, this highlights to us how popular gambling is today, and how accessible it is. It literally ruins the lives of many. It is a problem which can be undetectable. You can keep it to yourself and lose everything. Friends, family, jobs, homes, everything. Unlike other addictions like drink and drugs, it is hard to know a gambling addict. They could be sitting quietly losing hundreds of pounds on their smart phones, without anyone knowing. This leads to severe depression and suicide if it gets bad enough. It is very easy to become addicted to gambling. You could have an interest in soccer and one weekend do a soccer bet and win some money from your first bet, and then become hooked. You are constantly trying to replicate a buzz you once felt, and it will come to a stage where this is impossible. For a gambler, it will never be enough. There are many social events which involve gambling. For example, a staff do at the horse or dog racing. Events such as these can give you the taste for gambling and suddenly a problem you never believed would be associated with you, is now a real problem in your life. It is an issue that is only getting worse and without some sort of intervention, it will continue to grow. It is constantly advertised and targeted to draw people in. There are constant television adverts which encourage you to gamble and constantly advertising promotions for new customer specials that seemingly can’t lose. The bookies are giving you “free money” to draw you in. We have seen many real-life examples of celebrities whose lives have been destroyed by gambling, from local GAA stars to millionaire soccer players. It will affect you at all times. It won’t matter whether you are a millionaire or have £10 to your name, you will gamble what is available and lose everything if you cannot control it. Unless there is something implemented by the government soon, it will continue to get worse, and continue to be the silent killer for many. Supernatural is a hugely successful TV, in its 13th season with a fandom that refers to itself as the SPN Family, this ‘family’ has created a unique support system for those suffering mental health issues. 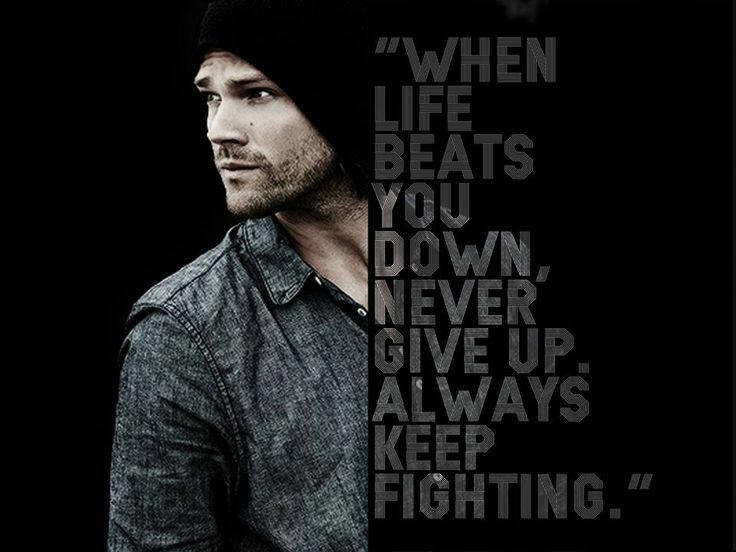 Jared Padalecki started a movement in 2015 called Always Keep Fighting, a t-shirt campaign that became a support network for fans. It is empowering for fans to hear their role models speak up about issues like this, admitting they struggle with this or just telling them that they aren’t alone. The way Supernatural actors Jensen Ackles, Jared Padalecki and Misha Collins has used their power and influence to create something that is inherently bigger than themselves is inspiring. 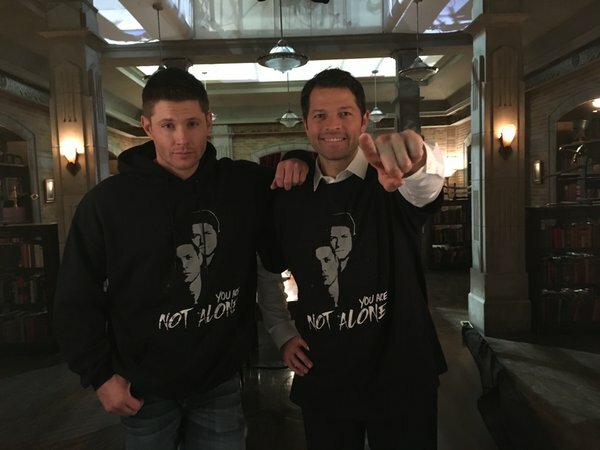 Jensen & Misha’s ‘You Are Not Alone’ campaign. In support of SPN Family Crisis Support System. There is a lot to consider before launching any campaign and different things that need to be taken into consideration. The success of Jared’s PR campaign is inspiring. What started as a t-shirt campaign by one actor has led to the collaboration between three actors as Jared and his co-stars Jensen Ackles and Misha Collins set up their support platform for those suffering mental health issues, the Crisis Support Network. “Why not try and harness this amazing power that the fans are accumulating and try to use it in a way that Misha has done with Random Acts?” – Jensen Ackles on creating the Crisis Support Network. 1. Set out clear goals for what you want to achieve. Taking the ‘Always Keep Fighting’ campaign, there are three clear goals to this. One, raise money for charities such as To Write Love On Her Arms, The Wounded Warrior Project and A.I.R. Attitudes In Reverse – Student Suicide Prevention – Mental Health. Two, to raise awareness of mental health issues that affect people such as depression, addiction, mental illness and suicidal thoughts. Lastly, the aim was to encourage people to speak out about their struggles. 2. Make a detailed and precise plan on how you want to achieve it. How will you achieve your goal? The exact method of attaining the targets for ‘Always Keep Fighting’ is unclear. We know Jared took to social media to share with fans. Actors such as Jensen Ackles, Misha Collins and Stephen Amell, promoted the campaign on their sites. 3. Do intensive research on the aim of your campaign. You need to know what your campaigning for to achieve your goals. Jared knew what he was talking about in his campaign as he suffers from anxiety and depression. Fans knew that this campaign was personal and something he felt passionate about advocating. 4. Monitor and tweak your campaign when necessary. What will you use to promote your campaign? Jared used t-shirts, hoodies, hats and bags with 100% proceeds going to charity. 6. Choose a channel for your campaign. Social media such as Twitter, Instagram, Facebook and Tumblr were used to promote this campaign. These co-stars have all spoken up about their experiences with mental health issues and its impact. Jared has spoken out on his struggle with depression and anxiety, Misha has talked about his experience of bullying, its impact and how he self-harmed in the past. Jensen also speaks about how he struggled with being away from his family, how particular storylines affect him and the impact watching Jared’s struggle had on him and how losing friends to suicide affected him. The number of fan testimonies of how these actors and their show have saved or helped them in some way is remarkable. 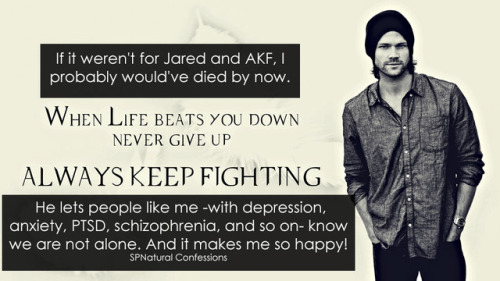 Jared, Jensen and Misha have proven themselves to be successful mental health advocaters on their use of social media; it is unusual to see social media being used to establish an incredible online support network of this magnitude for those suffering from mental health issues. The reminder that your favourite actors are human too, that you can have money, success and fame yet still struggle with your mental health creates a sense of solidarity between the celebrities and fans. The cast of Supernatural has managed to perfect this, and use it as a way to promote awareness.